The Editor’s Choice paper for issue 103:6 is “Fog as a source of nitrogen for redwood trees: evidence from fluxes and stable isotopes” by Templer et al. Journal of Ecology Editor Amy Austin has written a commentary on the paper below, which is part of a new Special Feature on biogeochemical cycling edited by Amy Austin & Amy Zanne. The majestic coast redwoods are, quite simply, impressive. Given that Sequoia sempervirens can boast to be the tallest tree in the world, and its cousin the giant sequoia (Sequoia giganteum) wins the prize for most voluminous tree, and with both species having some of the oldest trees alive, there is no denying their mystique as ancient wonders of the natural world. Coast redwoods have a very limited distribution, occupying a narrow strip of land approximately 750 km long and 50 km along the Pacific coastline of California and Oregon in North America. And there is a reason for this. One of the ways in which these trees are able to grow so tall, and withstand an extended summer period without rainfall typical of Mediterranean climates, is that they have a particular capacity to harvest water from fog drip, which can contribute 15-45% of the annual transpiration of a redwood forest stand (Dawson 1998). More fascinating is the fact that the leaves themselves appear to directly absorb some of this fog before it condenses as liquid water and enters the soil (Burgess & Dawson 2004). This clever strategy allows the trees to maintain an adequate water status when soil water is scarce and fog is abundant, as well as preventing dehydration and excessive transpirational loss during times of drought. The Editor’s Choice paper for this issue of the Journal of Ecology “Fog as a source of nitrogen for redwood trees: evidence from fluxes and stable isotopes” by Templer and colleagues demonstrates even more cleverness on the part of the coast redwoods. This study explores an additional component that comes rolling in with the fog to these nutrient-poor forests –nitrogen. While nitrogen has been measured in fog in these coastal habitats (Ewing et al. 2009), it was not clear whether or not the trees might be taking advantage of this nutrient subsidy accompanying the fog water. 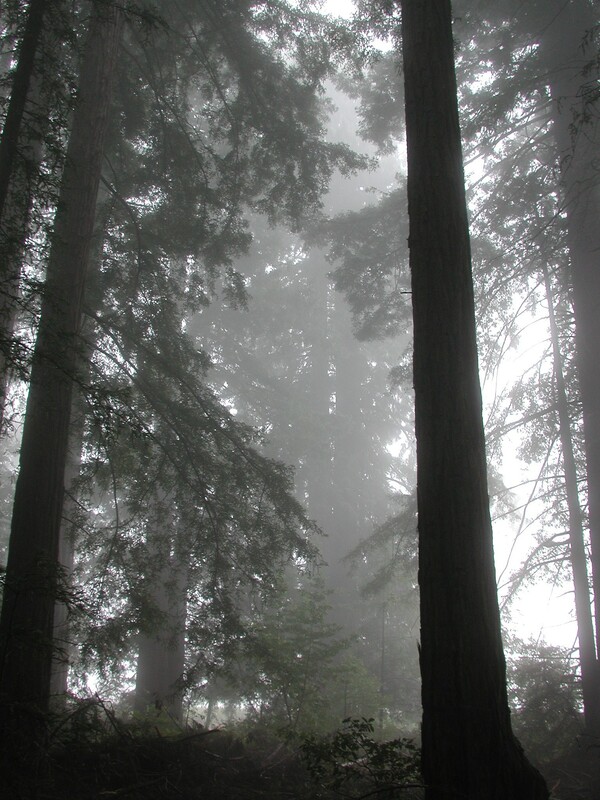 Analysing the natural abundance of 15N and 13C stable isotopes in soils and fog demonstrated large differences in the δ 15N signatures of ammonium, which allowed the researchers to identify that the redwood trees nearest the forest edge were indeed ´harvesting´ a fraction of the nitrogen that was coming in with fog. And comparison with soil nitrogen and similar root δ15N values between the forest edge and the interior trees led the authors to conclude that the nitrogen in fog was being principally absorbed directly by the leaves! The increased nitrogen availability from fog sources through direct absorption and increased soil nitrogen from throughfall, together with more favorable plant water balance, allowed for greater rates of photosynthesis during the drought period, with the forest edge redwoods benefitting doubly from the fog subsidies. This study unravels more of the complex ways in which this species is able to prosper and attain dizzying heights in spite of a highly seasonal water supply and relatively infertile soils. However, there is trouble on the horizon. There has been an estimated 33% reduction in fog frequency in the last 100 years along the Pacific Coast of California (Johnstone & Dawson 2010), sounding alarm bells for the potential water stress that this could exert on these trees. The findings of Templer and colleagues suggest that this reduction in fog frequency could also impact the nitrogen status of the trees by removing an important exogenous source of nitrogen that is directly accessed and utilized by the coast redwoods. Even more alarmingly, the extended drought in California, which has been linked to anthropogenic climate change (Williams et al. 2015), is now threatening these majestic giants, both inland and on the coast. It has yet to be seen if the combined effects of reducing fog subsidies and intensifying the summer dry period will wreak irrevocable harm on these emblematic forest ecosystems. Burgess, S. S. O. & Dawson, T. E. (2004) The contribution of fog to the water relations of Sequoia sempervirens (D. Don): foliar uptake and prevention of dehydration. Plant, Cell & Environment, 27, 1023-1034. Dawson, T. E. (1998) Fog in the California redwood forest: ecosystem inputs and use by plants. Oecologia, 117, 476-485. Ewing, H., Weathers, K., Templer, P., Dawson, T., Firestone, M., Elliott, A. & Boukili, V. S. (2009) Fog Water and Ecosystem Function: Heterogeneity in a California Redwood Forest. Ecosystems, 12, 417-433. Johnstone, J. A. & Dawson, T. E. (2010) Climatic context and ecological implications of summer fog decline in the coast redwood region. Proceedings of the National Academy of Sciences, 107, 4533-4538. Williams, A. P., Seager, R., Abatzoglou, J. T., Cook, B. I., Smerdon, J. E. & Cook, E. R. (2015) Contribution of anthropogenic warming to California drought during 2012–2014. Geophysical Research Letters, 42, 6819-6828. October 20, 2015 in Announcements, Editor's Choice.